in Peter & the Wolf.) To the mice, however, add a real obscuro — Amos Mouse in one of Disney's earliest cartoons known mostly for its use on television, Ben & Me. Even more obscure is the fact that the 21-minute short had a brief theatrical presence before appearing on the studio's weekly TV show. It was released on November 10, 1953, packaged with the Oscar-winning short feature The Living Desert, part of the "True-Life Adventures" series of nature documentaries Disney produced during that decade. It was the following year, that it was first televised. Like Warner Bros.' short cartoon Tom Thumb in Trouble, Ben & Me had certain aspects of a feature. It was directed by Hamilton Luske, whose other directorial credits include Alice in Wonderland and Peter Pan. The Chuck Jones piece may, say commentators, have been practice for a feature. But Disney had plenty of practice with features, in fact had recently resumed production of true features, as opposed to the less- expensive compilations it had made during most of the 1940s. A few years earlier, Ben & Me would probably have been a segment of a compilation like The Reluctant Dragion or Fun & Fancy Free. By the time it was made, such cartoons were being marketed separately as shorts, but somewhat longer shorts than the one-reel Goofy or Humphrey Bear entertainments that were even then being phased out. Others in its marketing category include the "Specials" Lambert the Sheepish Lion and Windwagon Smith. But even those disappeared over the next decade or so, leaving only features like The Fox & the Hound (1981) and compilations like The Many Adventures of Winnie the Pooh (1977) to keep Disney animation going before the revival in the late 1980s, when Roger Rabbit and DuckTales became popular. 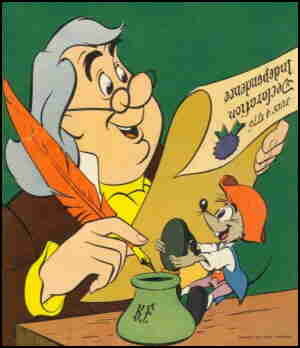 The story purported to be a reminiscence of Benjamin Franklin by Amos Mouse, a close associate. It started with a modern crowd admiring a statue of Franklin. It went from there into a description of the relationship between the two, and how it changed Franklin's life for the better — right at the beginning, Amos inspired Ben to invent the Franklin stove. It was narrated by Sterling Holloway (who also narrated the "Cold-Blooded Penguin" segment of The Three Caballeros), in the role of Amos. Ben was Charles Ruggles (Aesop). Hans Conried (Snidely Whiplash voiced supporting character Thomas Jefferson. It was based on a 1939 children's book written and illustrated by Robert Lawson. Lawson also illustrated Munro Leaf's earlier story that Disney adapted into Ferdinand the Bull. Text ©2008 Donald D. Markstein. Art © The Walt Disney Co.